Though not officially a rap duo, Jay Rock and Kendrick Lamar are both associated with the group Black Hippy, alongside Ab-Soul and Schoolboy. 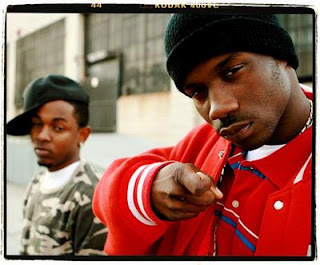 Both rappers have been featured on XXL's Freshman lists, Lamar in 2011 while Jay Rock appeared a year earlier. Despite the time difference, both artists released their debut albums this year: Kendrick Lamar dropped digital release Section. 80 in early July while Jay Rock came with physical effort Follow Me Home a few weeks later. Both albums recorded poor sales, neither breaking the 10,000 mark in the first week, but received strong praise from critics. Section. 80 was especially admired, Soul Culture awarding the project 5 stars. Though the two are part of the same crew, each has an entirely separate style and approach to making their music. Kendrick is noted for his complex double-time flow and strong socio-political content, while Jay Rock concentrates on compelling hood tales reminiscent of a young, hungrier Game. The vivid political outlook of Lamar can best be seen on his album standout 'Ronald Reagan Era', where the rapper discusses the bleak conditions during the 80's presidency over a brooding RZA instrumental. 'Rigamortus' showcases a complex approach to rhymes schemes while 'Keisha's Song' demonstrates a mature approach in documenting the problems facing young women in deprived concrete jungles. Dr Dre and Snoop Dogg have both co-signed the MC, with Kendrick reported to be working on Detox. The praise, however, is taken with a pinch of salt by the rapper, proclaiming that he would have to break the wrist of anyone trying to give him a handout. Lamar has impressive confidence for such a fledgling career. Follow Me Home was released on Tech N9ne's Strange Music imprint after Jay Rock was dropped from Warner Bros. When I first listened to the album, I was not expecting much. The buzz he had garnered in late 2008 had faded and I suspected he had been overrated by the Freshman selection team (OJ Da Juiceman? Donnis?) I was instantly forced to rethink when I heard the album opener 'Code Red'. The song is a gritty hood tale played out over a mournful piano laden beat, reminiscent of Dr Dre production. The theme continues on 'Elbows', a low-riding West Coast banger. 'Just Like Me' is a cautionary retort to those who attempt to glamorise the thug way of life. Rock hasn't quite made it to rap superstardom yet, but his debut album shows an encouraging depth of talent.